I had a rather loud chat with a couple of the crew from the this huge fusion project: the brain child of Mr.Savona, this is a fusion between Cuban musicians and Africa in the taste of dub and reggae. Delicous! LADAMA is a group of all powerful females from various places in South America, they come together to inspire one another with their local rhyhms, but also to teach and educate women around the world as they travel. Prog-rock funky pyscadelic trio from Amsterdam talk to me about their concepts behind their music, and much more. Legendary band that have been playing in Kenya and all around Africa for 40 years, FINALLY make it across the pond, and I get to chat to them about their first festival in Europe / England, audiences around the world and their style of playing and music making. Ethio-jazz queen is stepping out of the Mulatu Astake spotlight for ethio-jazz and is taking the name for herself, I talk to her about how she keeps her music contemporary and what makes musicians important in society. Amadou and Mariam need near to no introduction: they have been chart topping the west African music scene for decades together. I was honoured to catch them and chat to them about their music making, community and music in Mali, and plans for the future. I spoke to one half of the instrumental hip-hop outfit Olly, about Herbalisers origins, why it's instrumental and their journey together in music. Tal National come from all over North Africa, and they bring their fusion music to audiences the world over. I spoke to them about the origins of their style and playing in England. I spoke to D&B legend and maverick Goldie, about living in Thailand, his painting career and how painting is related to D&B. When I was ruffly 16 years old, I listened for the first time to a global fusion album. This album was Release by Afro Celt Sound System. The album boasts multi-culturalism, with Scottish bagpipes, traditional Irish flutes, fiddles, Indian rhythms, West African Kora… to name but a few, all fused with infectious unstoppable electronic dance beats. This album changed my life. I had never before danced to anything non-western in sound. Nor had I heard fusions from the global North to South. I had also never previously heard the bagpipes sound funky. Afro Celt Sound-System as the name might suggest fuse traditional Western folk instruments with West African instruments and merge the whole thing into the electronic dance scene. Formed in 1995 the Afro Celt band consists of mystro musicians in their own right. In this interview I talk to Simon Emmerson, a prevalent figure in the changing musical trends in London since the 70’s, Larla O Lionáird of the Irish influences, and N’Fale Kouyate, the West African griot Kora player. Together in a cosy yurt at WOMAD Festival 2017, we spoke through the changing trends in music, the global Norths relation to African music and the London music scene through the ages…. 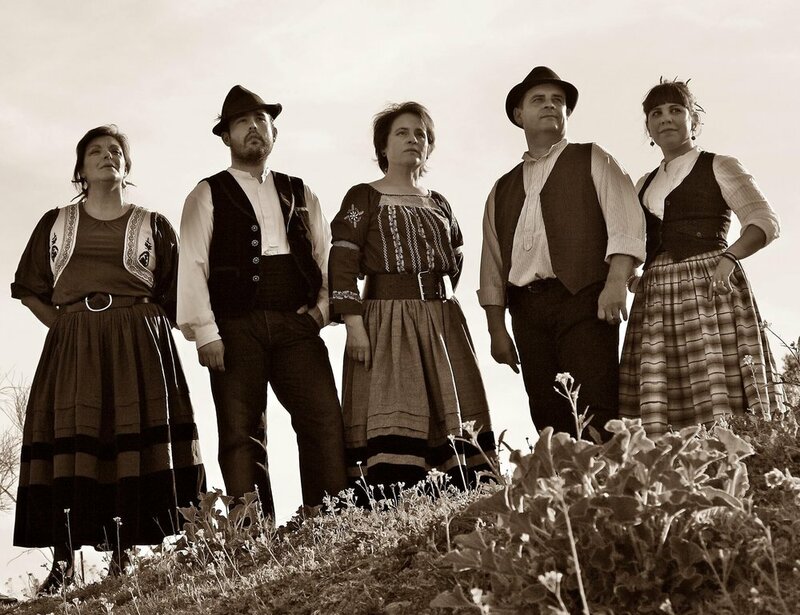 I was overwhelmed to be given the opportunity to talk to Afro-Celt Sound System, as a long time lover of their fantastic fusion of traditional folk musics of the global north, with traditional folk musics of the global south, the incredibly versatile fusion dance music has had me dancing for years. I wanted to try and map out the various influences in Afro-Celts vast discography of music spanning from their first album release ‘Volume 1: Sound Magic’ (1996). Having since spanned a further nine albums, the endless array of incredible sounds from one album to the next is truly worthy of the term musical ‘melting pot’. I started by asking the guys where the Irish Celtic influences came from within the band…. Larla: well it comes from Simon meeting Davy Spillane from County Clare in Ireland and they met over Baba Mal records, and that was where the initial content was, and ever since then there’s been a array of performers and singers who, also some Scottish musicians, so theres a big heavy influence and I joined the band a few years ago and I have been playing the Irish flutes and bohdrán. SD: Im studying ethnomusicology in SOAS and I just love it, so can I ask, how did it all come together, with the Scottish the Irish, I know the West African and Indian rhythms too? Simon: Yeah I mean we use Bhangra grooves, Dub grooves, yeah it's a melting pot. SD: How are the songs constructed? Is it all the work of one genius conductor? Simon: Ok so I never wanted to be a virtuoso musician. I started of as a punk, my primary agenda was probably as an activist, but then over the years, you get a little bit older, and then music has become a big part of my life. But as a record producer, I got very interested the music that I grew up with in London. So as a kid I grew up in South London, I was surrounded by reggae and ska, I as a punk I was very much on the fringes of all the sound systems that you had in London. In the early 80’s I worked in a jazz specialist shop called ‘Mole Jazz’ and I got very into jazz, but I discovered African music. I discovered the music of West Africa; Fela Kuti, I started trying to play African guitar in the way that Africans do it, but in my own kind of punk way. So I met a guitarist called Spike, who was in a punk band, and we became part of a band called Weekend and we were playing kind of African licks in a kind of Indie feel. That soon developed to me being in a band called Working Week, through all that I ended up in Africa in the early 90’s and it was Davy Spillaine who set me off on the road to the Afrocelt because he told me that the aboriginal Irish were dark skinned and that there are loads of legends of dark skinned Irish. He told me lots of stories about how the North Africans having frame drums like the ‘bodhrán’ and having pipes, and I got interested in the Bardic tradition which is the kind of western magical tradition that goes back to the idea that music is a transformative power, that through song and poetry you keep the ancestral legends alive. I met through Baba Mal, I met the griots, and N’Fale is a West African griot, and living breathing proof that the Bardic tradition is a reality, because this is exactly what N’Fale does, it is his culture, and he is a founder of Afro-celt Sound System. SD: Fantastic, so tell us what is your instrument? N’Fale: My instrument in the Kora (twenty-one stringed Harp, West Arica), and the Balafon (wooden xylophone, Gambia) and I sing. SD: Wonderful, as a student at SOAS University (London) we have the opportunity to spend six weeks studying the Kora. It’s such a beautiful instrument. SD: So in the group we have many different origins, I was wondering if there is a place you perform as a group that feels like a home for the band? A base? Simon: The band was conceived at WOMAD 1995. That was the fist time I helped introduce a kind of post acid house rave Sound System called Whirl-y Gig*. In 1995 Whirl-Y Gig set up a tent at WOMAD and we played there. Here there was a lot of my friends with bands like Joy, and Transglobal Underground and all the kind of fusion techno bands. Many of which were based in East London. A lot of us were. The East London Asian community had created the kind of Asian Underground so you had Johnny Kalsi and we were all clustered around the Whirl-y Gig, of which came to WOMAD, and then from that we started working with Real World (Records). So in a way Real World records and the Whirl-y Gig were very much the source, perhaps the origins of the band. That was because East London was this kind of melting pot at the time of multiculturalism, and we’d all been brought up with music from different cultures. Where as Ireland was much more kind of isolated culturally. Lara: At that time for sure, actually. My sort of introduction to sounds from around the world; so I lived in New York 2000/2001 for about a year and a half, and I’d have the most amazing experience when I walked home. Each block I passed would have a completely different musical sound. You had the meringue from Puerto Rico you had the Arabic grooves from Morocco, there was a trance session on in the next block and polish music over the road. This was the sort of scenery I had when I’d finish work and I’d walk home, and so that was something we didn’t have in Ireland. For me going to New York was a similar experience to Simon with WOMAD and such. N’Fale: Latino, the jazz and the pop, the blues all the blues, the pentatonic. In my country there are many natural players, my Uncle is the director of the National Ensemble Traditionál, all these differences come to this National band to build an Orchestral Ensemble, and me I educate in this family, and I discover many different cultures. Polyphonic singing, such as the singing. I am a teacher in Belgium of singing polyphonic, and I do some singing workshops in WOMAD, I use that and I catch some singers too. I am now also in Guinea musical director to coach some people, but this experience Africa gave me many possibilities to hear more different. Because I learn in the traditional musical family, I have no choice in my musical education, but when I go I go to a different cultures to study, and to mix again the music. The big musicians always like the musician from African. N’fale: Yes I think we are always sharing, I have worked with for example Lady Smith Black Mambazo, and many others. All these experiences gave me endless possibilities. With Africa being a very nice experience for the world music; to be honest the term world music… I don’t think if I perceive very much that… because they choose the jazz out, and the French music out, the pop and rock … and the rest… what do we have to do with this? Ok same bag; world music. SD: I completely agree, it can be said that it would only seem to be world music from people in the western hemisphere, as it’s only our genres excluded. Nfale: In Africa they sing in R&B and they come and sing very nice, but if they hear them they say ok, world music, because he’s from Africa. But then there is jazz music in Africa, the base of jazz, and the blues is from Africa as is the pentatonic, but they call them ‘world music’. SD: Such as the music of Afriqoui, they have the Kora with electronic music, and African calabash drumming dubbed…? N’Fale: I use the calabash, completely traditional, and I used completely modern Panasonic electronic, such as my Wah Wah with my Kora, *impression of a wah wah pedal*. N’Fale: I have one pedal that I like with the sound of the Kora, very very unique to other griots. SD: I was hoping to know what music you guys are listening too at the moment in your spare time? Lara: Yeah you know I listen to everything from Rock, to folk music to electronica to classical there so much music I listen to it all. Theres a great radio station in Ireland I love. I love that it goes from jazz to classical to pop, to rock. There all just sounds from different genres, I hate, I dislike being put into a genre. With this, the band and myself were summoned away from the yurt in order to get ready for their performance. I made my way over to the Charlie Gillet BBC Radio 3 stage where they we to play and awaited. As expected, the crowd grew immensely, an obvious choice on the bill it seemed. Sure enough out came the band, with Indian drums, Koras, balafons, Irish flutes, Scottish Bagpipes various percussion instruments and of course vocals. Afro Celt Sound System did not let down. They proceeded to play an electrified performance with grooves that demand dancing, melodies that shake the hips and beats that stomp the feet. I felt incredibly pleased to see the awesome fusion dance music performed live with such liveliness, passion and energy, all worthy of the 20 year strong band. Having recorded her first album ‘Moussolou’ in 1989 in Bamako Mali, Oumou Sangare has made the music of her homeland: the Wassoulou region in Mali one of the signature sounds to make it globally from West Africa. As well as this, Oumou has globalised the local sound of the Kamale Ngoni. Having been singing since a young child, and catching the attention of many, including African blues maestro Ali Farka Touré, as a voice of her generation. Oumou even went on tour at the age of 16 with the percussion group Djoliba, and by the age of 21 Oumou was already a star. Aside being the ambassador for Wassoulou, Oumou has alway used her voice, local and globally for social comment. Specifically commenting on topics such as women status in society, child marriage and genital mutilation. Her first album was an unprecedented hit in West Africa with over 200,000 copies sold locally, consequently in the coming years, Oumou played at every major venue in the world, and toured with global legends. Using her voice for women across the world, Oumou was named ambassador of the FAO (Food and Agricultural Organisation - fighting hunger across the world), furthermore she won the UNESCO (promotion of peace and security) prize in 2001 for her work speaking out on social issues. Of course in the proceeded eight studio albums, Grammy nominations, amongst many other awards have showered Oumou, and she is celebrating her latest album release ‘Mogoya’ (2017) by playing a few gigs around the world. I find myself here at WOMAD Festival 2017 about to talk to Oumou Sangare before her big show on the main stage. As I wait with her for our translator I am taken aback by her sheer presence. An energy emanated from Oumou has an intensely powerful, righteous woman. A little humbled, I began…. Sophie Darling (SD) : Firstly, it is such an honour to be sitting here opposite you. I am in love with your music, and also with your activism. You’re an advocate for women rights, I wanted to talk about the difficulties of your strife? Was being an advocate for women rights and such a conscious decision you made to use your voice to make these political opinions, or was it something that came naturally? Something you felt you had to do? SD:I am aware that one of your albums is entitled ‘Ten Kola Nuts’ which is the going currency for a Malian wife, can you tell us about that concept? Why did you want to talk about it? OS: It’s like a marriage package, It’s like an engagement, it’s an asking. There’ a lot of different stages in marriage, the engagement stage, then you have the devot-age stage. Basically I wanted to talk and use it as a symbol to talk about marriage, because for me that’s what deprives women of her rights, ok marriage can go well and it’s good for her, but if it goes badly, then the woman will be deprived of her life, she might become a slave, and she doesn’t want that to happen, it’s a symbol… it’s symbolic. SD: At what age did you start to play with the music Are your family musical? Where you encouraged to play music? OS: My mother, my mother *laughs* didn’t want me to leave school to follow music, but she did want me to sing, because my own mother was a great singer, my grandmother was a musical star as well, and so my mother encouraged me, as my mum said she would hear her mothers voice in me, but she didn’t want me just to be a singer, she wanted me to follow my studies as well as be a singer. SD: Has your mother managed to see you perform at all? OS: Now yes *laughs* oh. No no no, go to school Oumor, she waited until I was a big girl, she waited until I was professional, yes. SD: I know that in the early days, Nick Gold the record producer of World Circuits took an interest in you after he was handed a tape of your recordings. How did you find things changed for you? Were the social barriers surrounding gender and music easy for you to manoeuvre? Were difficulties enhanced? OM: No, the story about how he heard the music was that Ali Farke Touré was a huge huge fan of mine . So when the first record came out, he was screaming my name everywhere, and telling everyone about it, and playing the music, this is when Nick heard it for the first time, and then he went to Bamako and he said he heard it everywhere everywhere, he said oh I love that women voice, I would like to meet her. SD: Wassoulou music, I was wondering if we could ask a little about that, as I don’t know much about it. SD: Do you have any pre/post gig rituals for good luck? OS:*laughs* Oh yeah, sometimes, I pour a small amount of water on the ground, sometimes I might forget, but always I try to do it, for the ancestors, for my grandmother. SD: Were you taught to sing, or where you born this way? I left feeling charged up by Oumous very presence. I joined the huge crowd awaiting by the main stage to watch the Songbird of Wassoulou take to the stage. Loved by an adoring audience, Oumour Sangare exploded the stage with her powerful voice that emanated across the festival. Playing old and new tunes, Oumou focused mainly on her album. With dedications to women, wives and mothers, the reaction was of indulgence and love as the audience danced and sung throughout the entire performance. I was honoured to have spoken to Oumou Sangare, and can confirm that the new album is fabulous. 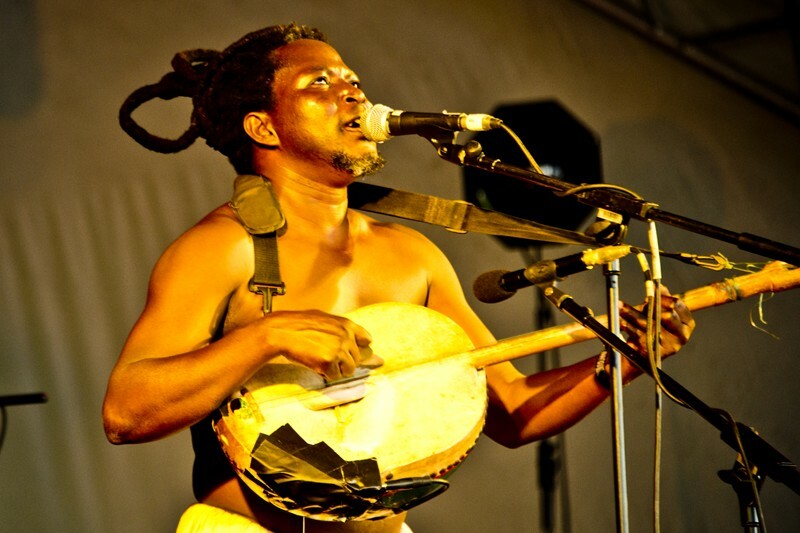 As a student of ethnomusicology, the concept of music as a form of religious or spiritual expression is something we frequently touch upon; be it the use of the African mBira for connection with the ancestral spirits, or the Islamic recital chanting of qawwali music, but Otura Mun’s debut album in his ÌFÉ outfit; IIII+IIII is a unique contemporary exploration of faith and spirituality through electronic music. Otura Mun: I initiated in Ifá; which is a part of the Yoruba religions as practiced in the western hemisphere. In which basically I am a priest, we are also called babalawo and our job inside that religious practices (Ifá) is divination. So my job is basically to find and define, what we understand as the divine destiny that each person is living or expressing at any particular moment in their lives, or looking back in their lives. So if you sit down in front of me, I’m going to define the sign out of the 256 (signs) that talks about the energy that you are manifesting. Otura Mun: My job (as a babalawo) is to identify the energies and help you balance yourself with it, with the idea that if you can grab onto your destiny and the life you are supposed to be living, and adhere to it right, and walk that path, then you are going to enjoy the fruits of life, have a long life of health, salvage relationships with people, you know, open roads in life. But if you're not doing what you're supposed to be doing, if you're not walking the path you're supposed to be walking, then you might experience loss and sickness and conflict. So my job is to help you see that destiny, and help you to give yourself to it. So some of what you're hearing in the record, is sort of maybe me coming to terms with another way to view the world around me. Because I initiated in this practice maybe around four years ago right; so this is an African religion and an African way of viewing and understanding the world that you live in, right. So maybe seven years ago I would have thought it would be silly to be praying to a stone, right, because of my western up bringing, I couldn’t understand that a stone has life, it is expressing itself, just the way that say this wood *holds table* is still expressing itself you know what I mean. But I couldn’t really wrap my head around that, it was me, meeting a new me, working through this new way of understanding the world, and inside of the songs, theres almost always a theme that I'm dealing with, and they’re general theme, say like loss or forgiveness. Otura Mun: It has been pretty amazing, I am really just overjoyed with the people that have hit me up from so many different parts of the world I think that were somehow able to connect through the music, on so many different levels, whether it was somebody who lets say is initiated in a certain part of the nation that let’s say is part of the religion, and say it touches them there. Or whether it's someone that doesn't speak either Spanish or English or Yoruba, but it is somehow able to connect with the sentiment of the album, in a very clear way. I’m just really grateful to be able communicate with so many different people, and for people to be able to pull something out of the record that’s meaningful, that’s special. Otura Mun: Home for me is in Puerto Rico, but actually to be honest, my home for performing is London. I love the UK, this is the third time I’v been here this year, all the shows we play in UK have been amazing. Im also a big fan of UK music, like I like listening to BBC One Extra, Mr.Jam is cool, I love al that stuff and so I mean, home is cool, we actually have played three shows in Puerto Rico in total, that’s it. It’s totally really well received, it’s just that the music scene in general is really conservative over there you know, it’s sort of over run by like, reggaetone and just a lot of crap music. And so you know, there is a space for what were doing, but it’s soo new, that the people, especially the young kids, haven’t been able to reach out and interact, so yeah we play internationally a lot. I managed to catch up with Otura Mun after his set at WOMAD Festival UK 2017. Otura was playing on the Ecotricity Stage at a sun setting time of 5-6pm. Having listened to the album extensively before the set I was expecting an immersive performance, however was taken aback by the reaction of the audience, whom much like a religious ceremony seemed completely entranced in his soundscapes, almost as if sacrificing themselves to the music. Playing nearly the whole of ‘IIII+IIII’ I left the set feeling as tho I had received a generous helping of IFE’s music, and with unshakable taste for more. I asked Otura Mun if this was the reception they always receive when they play? Otura Mun: I tell you we didn’t want to leave the WOMAD stage! I suppose we do receive a similar audience participation wherever we go, but you know once again, the UK crowds are a lot of fun. For some reason I think that you guys know electronic music out here, and so you're used to those sounds and those types of performances, and so yeah, I just think that theres something about it, I don't know what it is, I can't put my finger on it, but this music in a way is built for you guys. I think perhaps you are the party people *laughs*. I highly recommend listening to IIII+IIII in solitary concentration. The beautiful harmonies of the lyrics resonate such as a choir singing a sacred Yoruba praise song. I feel that the album is a journey through the faith and ÌFÉ is the carriage of our discovery. Perhaps in this new era IIII+IIII marks an age of albums being a medium of faith expression, and in themselves become an artefact of religious meditation. IIII+IIII in this case becoming Otura Muns religious manifesto. The opening song being perhaps the opening ceremony in our journey; with a call and response typical of it’s African influences, along side the cuban son rhythms, we are welcomed to the melting pot of inspirations to be found in the album through a soft meditative chant. The album then immediately picks up in the second track ‘Bangah' (Pico y Palo) with its foot tapping electronic Jamaican dancehall esc energy, suddenly we are able to revise and absorb the message, but it seems we can also express the album through dancing. The third track ‘YUMAVISION' diverting and taking us to a trip-hop ÌFÉ. As well as taking us through a concoction of traditional and contemporary sounds; IIII+IIII also subtly and seamlessly blends Afro-Cuban rhythms, such as their use of the ‘Son’ rhythm which inspired Salsa and originally was of an Afro-Cuban descent. ÌFÉ helps to shine a new light on these otherwise heavily Afro-Cuban sounds rarely heard outside the boundaries from which they originated. All in all, ÌFÉ’s IIII+IIII may be a personal spiritual exploration for Otura Mun, but it’s also a unique exploration of music as an expression of religion, blurring the line between preacher and the preached and perhaps adding a medium to how one can express faith. Maya Youssef took to the WOMAD Festival 2017 Ecotricity stage on the Friday 3:00-4:00pm and there played her unique Syrian music that rightfully has earned her the title ‘The Queen of the Qanun’ of which Maya is a virtuoso plucking the 72 stringed zither with practice, passion and class. In this interview Maya Youssef discusses how she came to graduate in both Arabic and Western classical traditions from the University of Damascus and since 2012, her journey to London, studying and later teaching at SOAS University, and what her new music means to her. Transporting back in time to seeing Maya Youssef play at WOMAD Festival, on stage accompanying Maya and her qanun were her trio, a fine set of simple percussion along side a standing bass. The audience, and myself were at the set where entranced, listening intently to everything that the lovely Maya had to say, and her versatile set, with emotional slow ballads, to more upbeat happy songs. The sound of the qanun is one of such intense beauty, and Maya Youssef plays it with such an intellectual spiritual familiarity. Having started to compose music only after the war broke out in her home country, Syria, Maya’s songs are a reflection of the all encompassing pain that she feels for her country, her people and the situation in Syria, and more so how it’s reflected around the world. After an emotional, powerful set, I met Maya Yourself to catch up…. S.D: How did you enjoy the set? MY: I absolutely loved my set, I think that the people received it so beautifully, they interacted with it in an amazing way, and I felt an overwhelming sense of gratitude by the end of it. SD: I noticed that a lot of the meanings behind the stories of your songs seemed to resonate with the audience, is this something you find at all your concerts? MY: Well the WOMAD audience certainly cheers with vigour, very loudly and proudly about the messages I was giving out. Maybe in other places they don't interact quiet as warmly, however I don’t mind, my excuse is that I feel that my songs are like seeds, and my hope is that they will grow later on. SD: You’re from Damascus I do believe; when did you come to London? MY: Indeed I am from Damascus, so at the end of 2011, I was presented with an amazing opportunity to apply for an ‘exceptional talents scheme’ in the UK in which I was selected for 300 artists from around the world to migrate to the UK, which was a real honour. At the time I was teaching at Sultan Qaboos University so I wasn't in Syria as the university is in Muscat Oman. Although I was really thinking about going back home to Syria, but because of the war, I accepted this opportunity and I was very very grateful for it, and this is how I ended up being in the UK. So I ended up moving her in 2012, and it has been amazing ever since. SD: So is this a busy time for you with gigging in the summer and everything? MY: It has been really busy throughout July but then I have two weeks off. Then straight back in doing Edinburgh Festival, and then Shambala. After that I will have some time off, so I am looking forward to that, and on the 20th of November I will have my album launch for ‘Syrian Dreams’. SD: For people that don’t know, can you tell me a little bit about you instrument the ‘quanun’? Visually, well what to say; there are so many strings! MY: Ahh yes, there are 78 strings, very specific, individually tuned. You see every three strings is one note, so I tune each three strings to be one note. It covers about three and a half octaves, and has a wonderfully large range of sound. It also has the strings tied on both ends with metallic leavers on the sides. These play the role of black keys on the piano, and these allow me to modulate, and change the pitches. Finally the quanun translated into Arabic means ‘the law’, so it is called this way because basically the other instruments are tuned to the pitch of the quanun, and also traditionally a quanun player was the leader of the ensemble. So it is one of the main instruments of Arabic classical music. SD: It sounds fabulously gorgeous. As it’s an Arabic instrument can we assume that is uses the ‘maqam’ scales? SD: In which case, when did you start to learn the maqam scales, and how long did it take you to learn them? MY: Firstly, the maqam scales are what the majority of Arabic music is based upon, and it has eight notes for every one western note. I learned from my teacher firstly aurally, and also had to learn on my own too, but when I had to start to teach it, I really felt the need to delve very deeply back into the scales and the hole maqam system of scales. So that was in Demascus when I was about eight and half/ nine, and I was heading to the city with my mother and the taxi driver was playpen a recording of the quanun. I was amazed, I needed to know what it was I said “wow, what is it, I want to play it”, to which the taxi driver laughed at me and said “no, this is an instrument played by men, you are a girl, just forget about it”, he was so harsh. I really should thank him, for he re-kindled the fire within me and I told him “yes” I will play the quanun. Then it became really crazy, because the very same night, in my site reading class, the head of the institute walks in and says “qanun class is open for registration, anybody?”. So without hesitation of corse, I went along to the class. My mother asked what she was to do with the violin they had brought me, and I said I didn’t care about the violin, and said they could send it away. Which they did, then within three days they had brought me a second hand qanun. SD: Wonderful, so it sounds as though you had really encouraging parents? Are they musical? MY: They are so supportive, really amazing. My father has a huge collection of music, but neither of them play any musical instruments. SD: I am aware that with other zithers of a similar family to your quanun the skill is taught in a master to student way only. Is this how you were taught? MY: Yes, absolutely, I studied with many masters, and had many ideas from them. Such as the idea of cosmologies; which is connecting scales to a certain time of the day, or too a certain colour. Then there are also two Turkish players I learned with, and I have been taught amazing techniques of Turkish quanun playing from them, I used all their knowledge and used elements of each to create something of my own. SD: How long had you been playing before you thought that you had managed to put your own spin on the instrument and had created your own music? MY: I started writing my own music after the war. You see before the war, they hadn’t come to me, I was happy to perform different repertoires, classical, western, therefore the need to compose had never come to me to. However after the war started, I felt I could either write music, or explode. SD:Would you go back to Syria? MY: Obviously its very dangerous to go there now so I can’t, but I do have family there. So I’m going to have to hope that this war will end very soon, so that I can go and visit my family. SD: I noticed that your personal politics and beliefs are in your compositions, is this something that you think is helping? Are you trying to spread a message? MY: I think I live in alignment with my beliefs, so when I say that I am hoping to spread a message of love and peace, I live it. I think that’s what the worlds needs really, and its’s very simple. By focusing your attention you can just change things. It’s really amazing, because we are so used to giving away our power, thinking, oh no, the news is awful, we can’t do anything, the world is collapsing. Actually you are way more powerful than that, we must focus our energy on peace. We just created some unseen ripple of energy that no-one can see. SD:Now tell me, can we expect an album soon? MY: Yes! We will be launching in November, in London and Paris. Very exciting. SD: Wonderful I look forward to it! Now my last question for you is this; Do you have any pre/post gig rituals? MY: I pray. Simply pray with my eyes closed connecting with my breath. In the North of Africa the great Sahara Desert spans across Northern Mali, Niger, Algeria, Burkina Faso, Mauritania, Morocco and plenty of North East Africa too. The Tuaregs are a nomadic people who have roamed the Sahara with their cattle since pre-colonial times. In recent decades civil unrest has made life for the Tuaregs hard and has resulted in years of violent conflict. However, the social and political unrest gave way for a new genre of music hailing from the exiled Tuaregs. Ibrahim Ag Albabib, band leader of Grammy award winning Tuareg musicians - Tinariwen, is accredited with creating ‘al-guitara’ music, so named for the addition of the electric guitar. They played the electric guitar in a blues style inspired by the likes of Malian desert mega star - Ali Farka Touré. Al guitara, or Saharan desert blues as it can be referred to by, mixed these virtuosic guitar solos with the traditional music fo the Tuareg cultures inspired by musical gatherings called ‘aggiwin’s. The songs are based around cyclical patterns and continuous characteristic grooving rhythms played on calabashes and clapping. All while with, predominantly male vocals in multiple harmonies. This new platform of music that was mainly decimated throughout the desert for years on home made cassette tapes that musicians would record their songs onto. This helped spread the music of al’guitara, and the ideologies of the Tuareg activists. Bombinos live album Agamgam released in 2010, is a good introduction to the life of the Tuaregs, opening the first track Ténéré opens with sounds from cattle. Considering the Tuaregs are a nomadic people of cattle, these sounds are idiosyncratic with the movement of nomads and their live stock. The second tune ‘Imuhar’ then opens with (I assume) is a Islamic citation, thus representing the religious ideologies of the Tuareg nomads of the desert. Bombino was raised a Muslim, and therefore taught honour and dignity, themes that run throughout his al’guitara music. Since starting to play, and traveling the world with his music, Bombino has played at all and any worthy festival, a favourite at WOMAD’s, this year playing at Coachella, and many many more. Furthermore Bombino now has three studio albums: Agadez, Nomad and Azel. I personally have found myself rather immersed in Bombinos long melodic guitar riffs, infectious rhythms and soft grooving vocals for a number of years, and find myself ecstatic to finally see him play at WOMAD 2017 Festival where he will be headlining the main stage. It was a beautiful moment to find out I would have the chance to talk to one of my musical heroes….Here’s what happened. In a beautiful rush, I found myself being swept behind the Main Stage to the artist press area, awaiting outside the white tent labelled ‘Bombino’. Stood outside the tent keeping to themselves were two men in fine Tuareg attire. As a fan, I knew I was looking at Bombino. I stood whilst a translator was being organised, after exchanging a smile and laugh I offered the gentleman a drink and they accepted. Without communication I enjoyed sharing a pleasant beverage with Bombino whilst we patiently waited for Bombinos English speaking bassist to be located. After a few minutes we off inside the tent, all communications go. I directed my questions to Bombino whilst our friend relayed two and forth between us. Bombino sat most humble and spoke with an almost silent soft voice. I was taken aback given the energy Bombino carries on stage to see that behind the shining lights and curtains stands an extremely humble, almost shy character, who speaks quietly, tends to not look up too much, and has an incredibly kind energy. After making ourselves comfortable and getting to know each other a little, I began to ask some questions…. Sophie Darling (SD): For people who aren’t familiar with your music and know if it as the Tuareg desert blues, is this how you would describe your music through your eyes and ears? Bombino (B): It’s universal music you know, it’s like the desert, the desert is big, it is open. But I am Tuareg and the bass is still Tuareg and then I mix with other colours and other things you know, so for me it’s universal music for everyone everywhere. SD: I’d like to know how you first picked up the guitar? B: I started to play guitar very young, this is why I was called Bombino, because I was a baby, and with a friend, a brother… in African everyone is your brother, we say brothers. So when I see my brothers play guitar, I come, I take a guitar and I try. And I take again and I try. So also I don’t have a professor, I am self taught, and then I develop my style. SD: I read that you were inspired by Jimi Hendrix… my question to you is there a one particular song that resonates most with you? B: *laughs* For me it is not just one song I love, I love them all. But this isn’t the point. The point is when I see Jimi Hendrix play his guitar, you see this connection between Jimi Hendrix and his guitar, you feel it, between him and HIS guitar, they are connected. I am very very fond of this, this is what I want, this is what I try to be. This connection is very important to me, the connection between me and MY guitar. SD: Where do you call home? SD:Have you been looking forward to playing WOMAD Festival (2017)? B: WOMAD is not the first time I have played here, but the first time it was so so special. This is my second time and it is still so special. I play a lot of big festivals like Coachella Festival and other big ones in the USA, but WOMAD will always be very very special. It is like the connections with the other artists and other musicians and the spirit here is different. And then we play another WOMAD in New Zealand and Australia, WOMAD is always an extra special show. It is true, all the artists want to play WOMAD. SD: Your songs are sung in Tamasheq, the language of the Tuareg people, can you tell us a little bit about your people? B: So Tamasheq is the language of the Tuareg people, and the Tuareg people they are in African in Niger, Algeria, Mali, Libya, Burkina Faso, so all across the desert, so it’s a large language, you can write it’s own scripture. SD: Was there ever a temptation to sing a more universal language, such as French? As a lot of the Malian musicians do for example? B: They are not the same, all the songs are written in Tamasheq because it is my mother language, the English people for example, they do not think in French, it would be, confusing? Why you think in French? So it is the same, I am Tuareg, and my mother language is Tamasheq, and so if I can sing in Tamasheq, it will be easier and it will reach a lot of people from home, from my community, so if I were to sing in English or French then a lot of people in my community would not understand, so it is an easy decision. SD: So, in closing, do you have any pre or post gig rituals for good luck? SD: Will you be coming to England on tour? SD:…and how about another album?… Please? Moments after we concluded our interview, with friendly hugs and goodbyes, I left Bombino to get ready for his big show, which he was due to stage in half an hour. I left the artist area, and with great excitement ran around to the front fo the main stage and stood in the middle of an already heaving crowd, awaiting the humble quiet man I had just spoken too. What happened next blew my mind, like the caterpillar blossoming into a stunning butterfly, this tranquil character who had just been so reserved exploded onto the stage in a flurry of unstoppable guitar riffs, like Hendrix on stage, Bombino played his guitar with such rock’n’roll muster I could barely believe it was the same man I had just spoken too. The entire gig’s energy sky rocketed, with dancing, singing, even screaming from the audience, the whole performance was stunning. The musicality was genius. Watching Bombino play endless cyclical guitar riffs, whilst singing, dancing, and hyping was immense. Truly one fo the best guitarists I have ever seen, the whole ensemble worked to perfection. A friend I knew in th crowd hadn’t heard of Bombino before however found himself bewildered at the musical talent, and found himself somewhat addicted to the Sahara Desert guitarist.